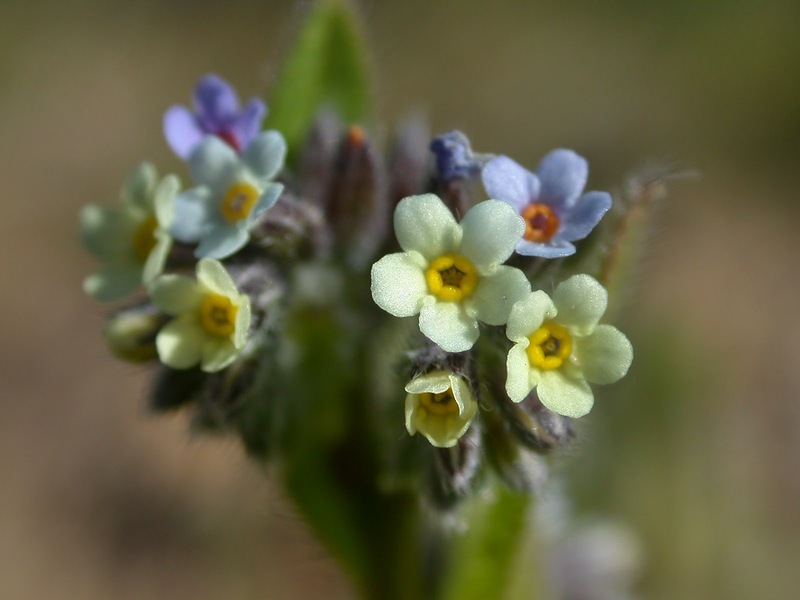 The Wood Forget-me-not was @SpeciesofUK from 24th to 30th March, 2014. 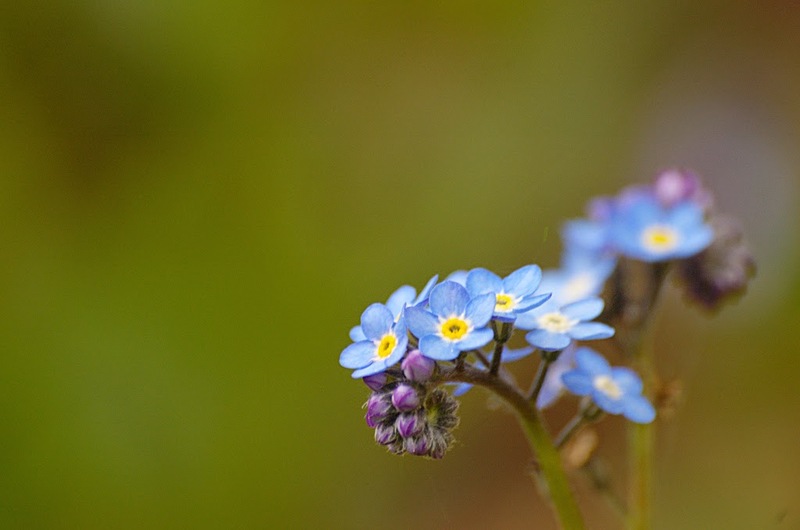 Forget-me-nots are flowering plants from the Myosotis genus. There are about two hundred species in all. 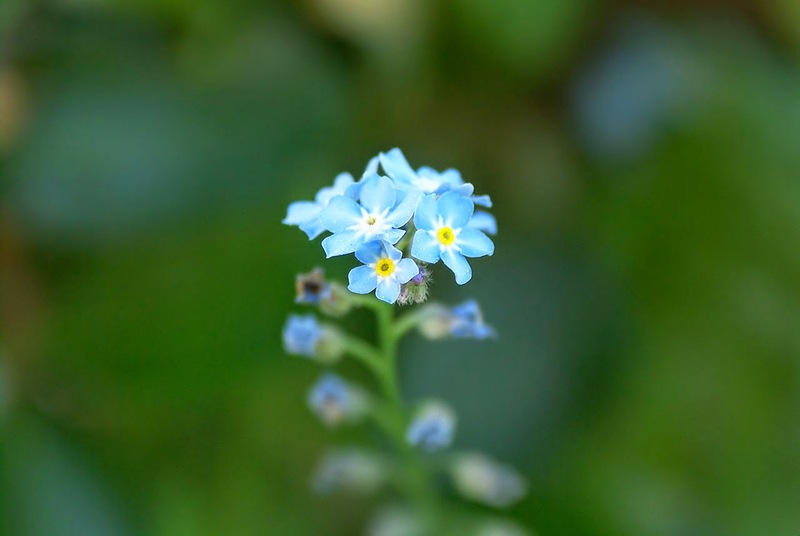 In the UK, the name forget-me-not most often refers to Myosotis sylvatica, the 'wood forget-me-not'. Wood forget-me-not is a UK and European native. 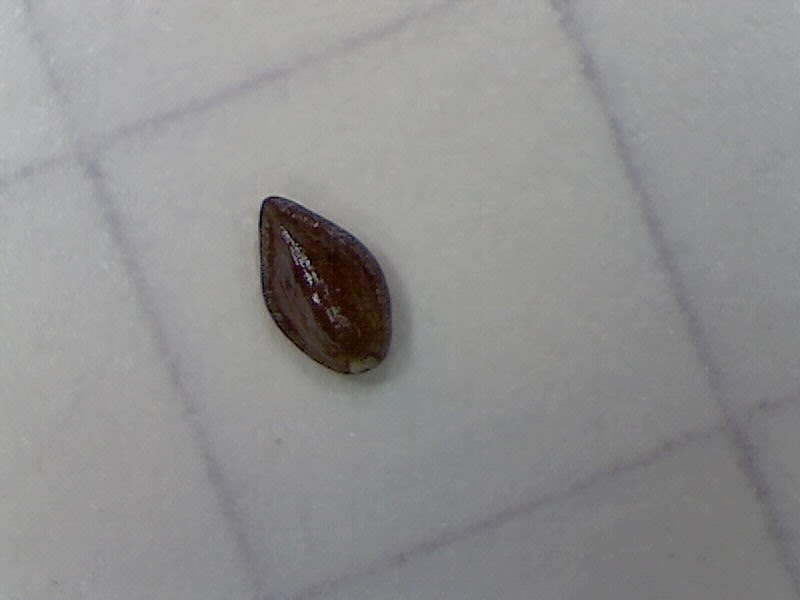 It is widespread throughout most of the UK although locally it can be rare. It’s absent from northern Scotland. Wood forget-me-not likes plenty of moisture and is very tolerant of shade. It thrives along stream beds, rocky grassland and in wet woodlands. Wood forget-me-not is a common garden escapee. If it's found outside of its typical native habitat, it's probably escaped from a garden. In fact, forget-me-not has spread so well from gardens that escapees have almost completely disrupted the natural, native distribution, both in the UK and elsewhere. As a result of human activity, wood forget-me-not has spread out of its native European range, into temperate regions around the world. 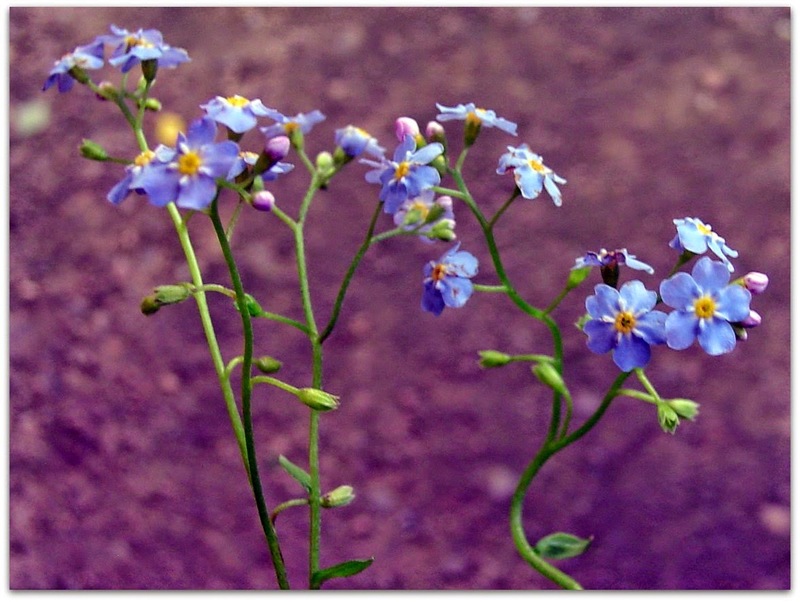 The name ‘forget-me-not’ appears in many languages. 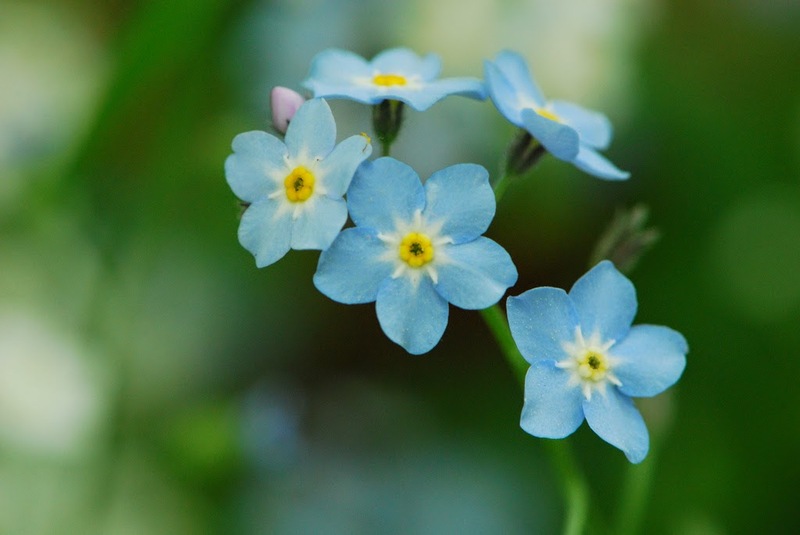 The name ‘forget-me-not’ originates as a loan from the Old French ‘ne m'oubliez mye.’ Wearing the flower was supposed to ensure you were not forgotten by your lover. Many other languages borrowed the same name from the French. For example, German Vergißmeinnicht, Swedish forgätmigej, Hungarian nefelejcs, and Czech nezabudka. 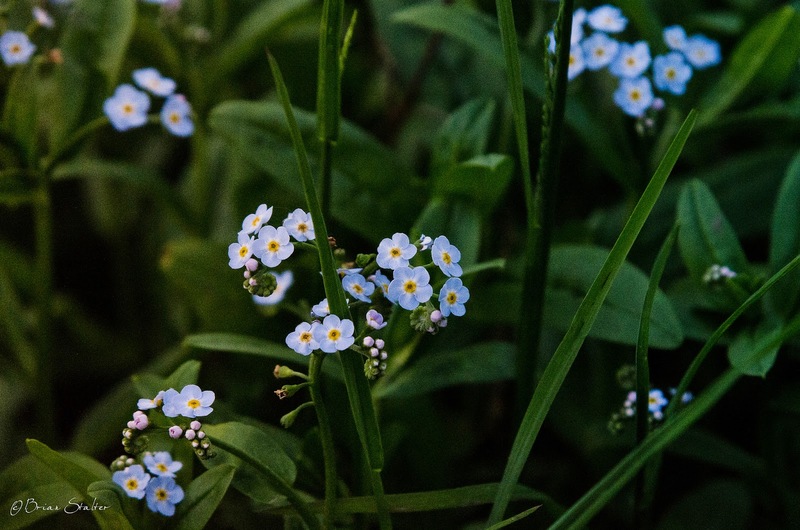 As well as the wood forget-me-not, other forget-me-nots in the UK include the early forget-me-not, changing forget-me-not, water forget-me-not and field forget-me-not. 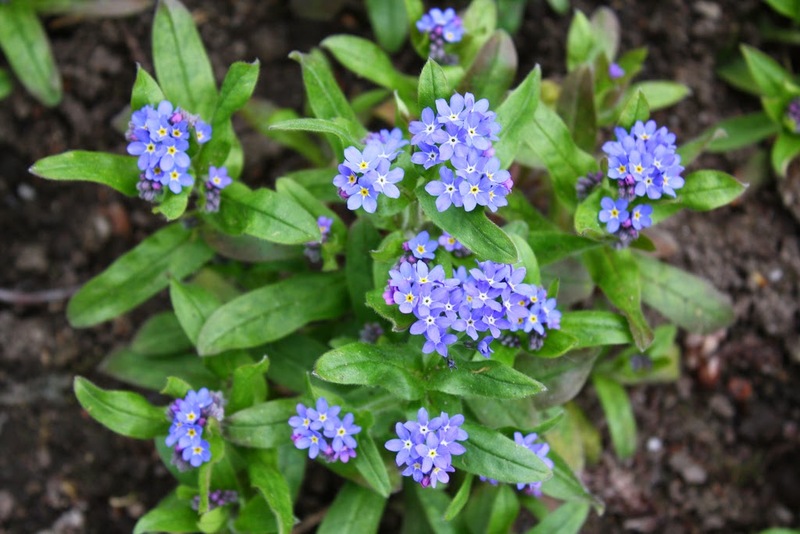 Wood forget-me-not is a shortish, softly hairy plant with distinctive flowers. Wood forget-me-not is a biennial or perennial. It returns each year to form an expanding clump and it flowers in its second spring. 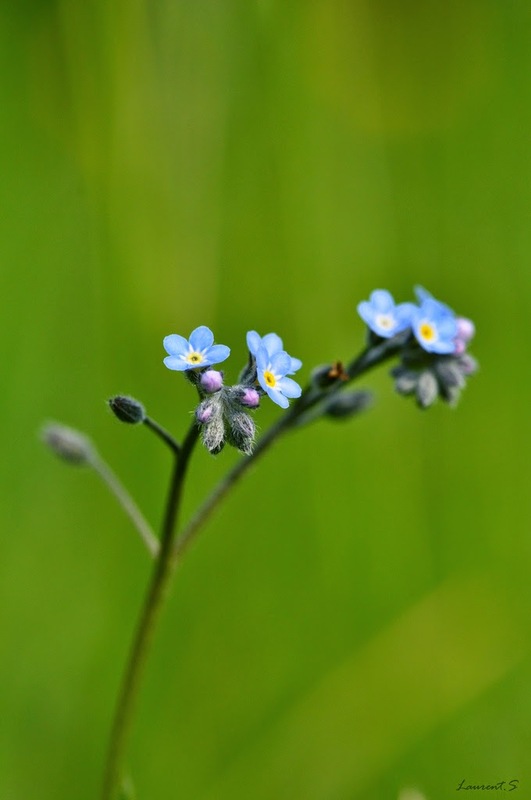 The stems of wood forget-me-not become highly branched as the plant grows, with spreading hairs. 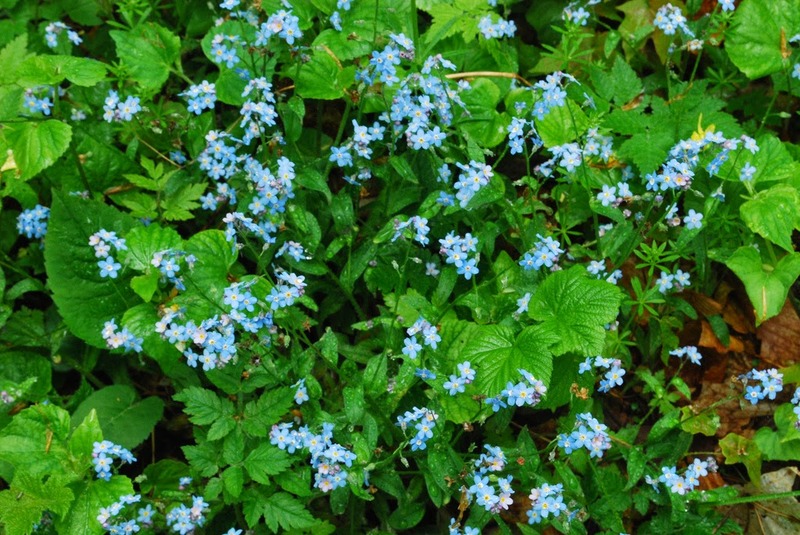 Generally wood forget-me-not is short, but it can grow up to half a metre in height at times. Wood forget-me-not has narrow, oval leaves. 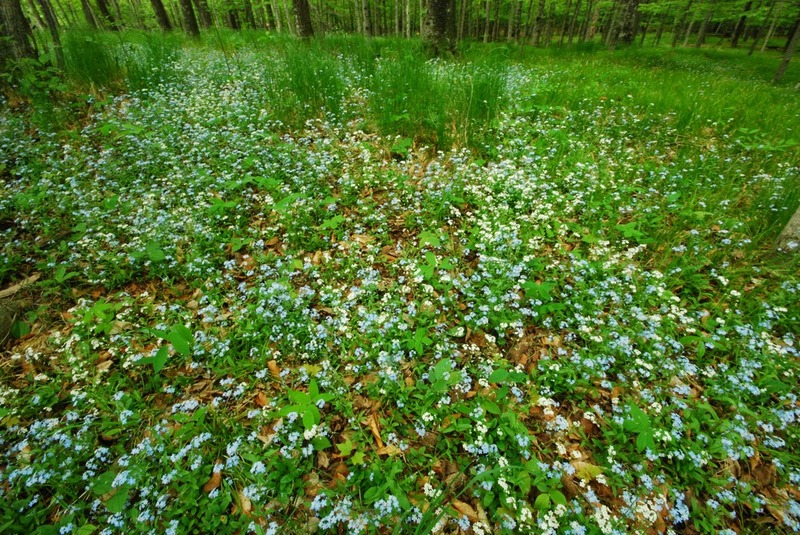 Wood forget-me-not forms clusters of tiny simple 5-petaled flowers. They are a soft sky blue with yellow centres. The flowers are notable for being almost completely flat. 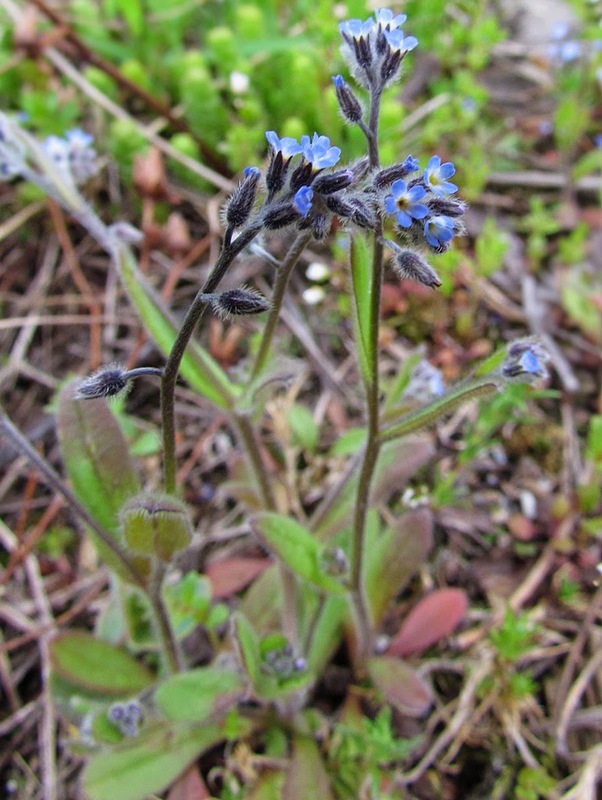 This can help distinguish it from the 'field forget-me-not,' M. arvensis, which has much smaller and concave flowers. Wood forget-me-not flowers from April to June, with the first flowers appearing at the end of March. 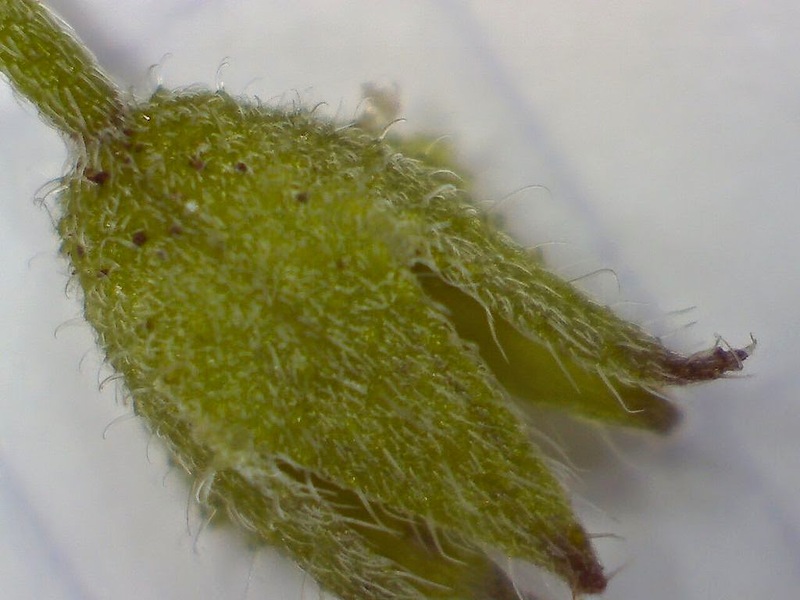 Wood forget-me-not has distinctively hooked 'calyx' (sepal) hairs. The mature fruit of wood forget-me-not is dark brown and shiny. As well as the wood forget-me-not, the UK is home to several other forget-me-not species. The 'early forget-me-not', M. ramosissima, is covered completely in white hairs and has sky-blue flowers which appear from April. The 'changing forget-me-not', M. discolor, is quite tall and slender. Its flower is creamy-white or yellow, turning blue later. The 'field forget-me-not’, M. arvensis, grows upright on open ground. Unlike wood forget-me-not which has flat sky-blue flowers, field forget-me-not flowers are grey-blue, tiny and saucer-shaped. The ‘water forget-me-not’, M. scorpioides, as befits its name, grows in boggy places and beside streams. It is also known as 'scorpion grass' due to the spiraling curve of its inflorescence. 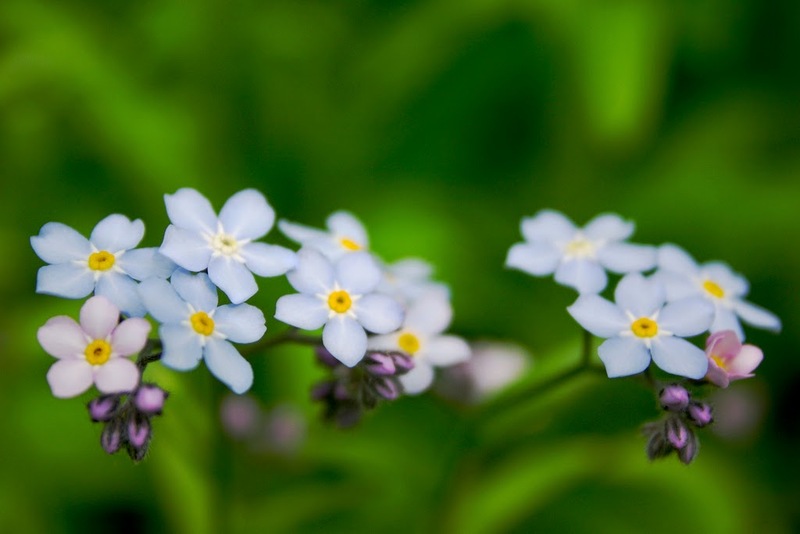 Forget-me-nots have a rich history in mythology and tradition. The Scottish poet William McGonagall wrote a poem called ‘Forget-me-not’ in which he immortalised one of the legends of the flower's origin. He flung the flowers to his lovely bride. But I'll name this flower Forget-me-not. There is a German origin-story for the name too. 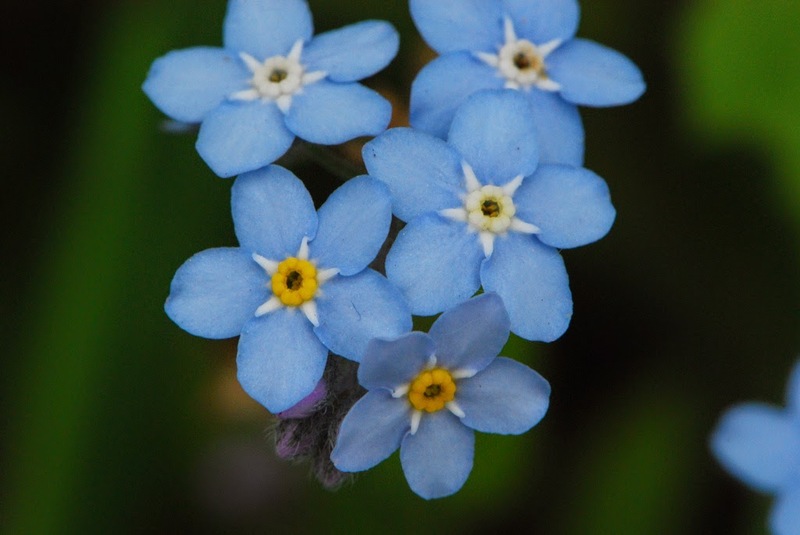 According to German legend, God named all the plants when a tiny unnamed one cried out, "Forget-me-not, O Lord!" God replied, "That shall be your name." 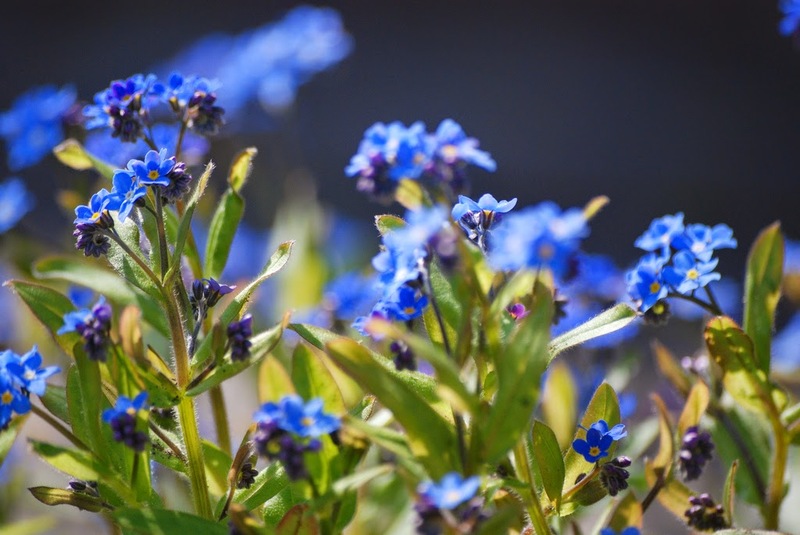 In parts of England, it used to be believed that forget-me-nots protected against witches, particularly in the month of May when it was strongly in flower. It was also said that the juice of the forget-me-not could enhance the sharpness of steel so that it could cut through stone. The English king, Henry IV, loved the forget-me-not. He adopted it as his emblem in exile in 1398 and made it a royal emblem when he returned to England in 1399. 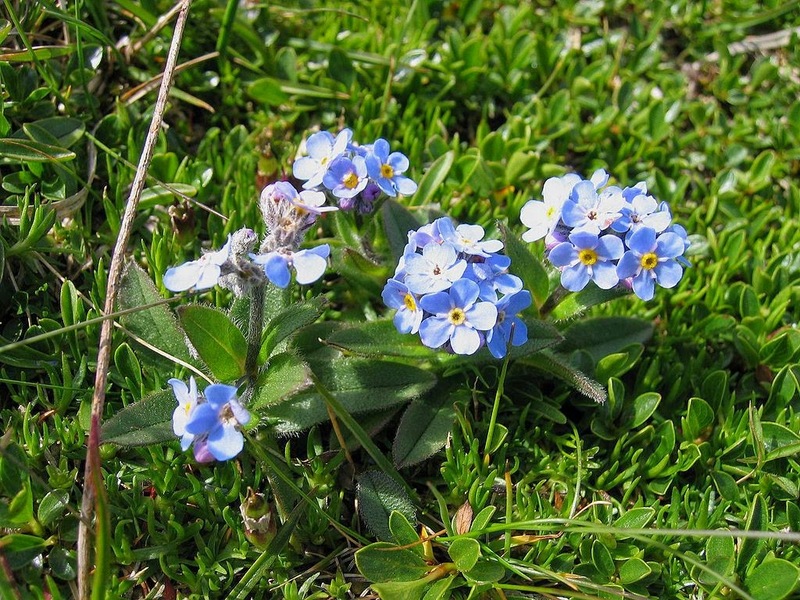 One of wood forget-me-not’s relatives, the alpine forget-me-not, Myosotis Alpestris, is both the county flower of Westmorland and the State flower of Alaska.